What is different about this publication is that it is a Patient-Based Approach rather than a Disease-Based Approach. 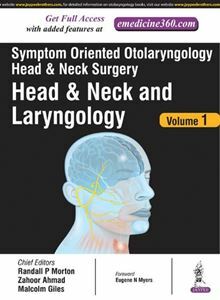 It may be summarized as "Otolaryngology in the Real World'; where patients present with a symptom, seeking a diagnosis rather than with a diagnosis already assigned. The text covers all the likely presentations of a patient to an Otolaryngologist-Head and Neck Surgeon. This book should be ideal for Residents in Training at a stage when they are learning their trade, as well as young Consultant Otolaryngologists embarking on their Specialist career. It also provides an excellent resource for the more mature solo practitioner, who is in solo practice without the ready availability of the collegial support.